Liverpool manager Jurgen Klopp speaking to BBC: "I’m so proud of the team, it was a fantastic performance. What a team, what a stadium, what an atmosphere. I’m so thankful I can be a part of this, it’s great. It’s just outstanding, very overwhelming at times. On the title race: "The first question in the meeting today was 'what is the City score?' You cannot avoid knowing about it. But it isn’t interesting to us. Manchester City manager Pep Guaridola speaking to BBC Sport: "It was really good, after Tuesday when we suffered a bit it was an incredible performance. There’s five games left, it’s in our hands but if we just drop one or two points we won’t be champions so we have to win all our games. More from Guardiola on the title run-in: "This pressure is incredible. We are fighting to be champions back to back. In two seasons we've got 83 points with five games left. We've won two titles (Community Shield) and now it's the FA Cup final. Liverpool defender Virgil van Dijk speaking to Sky Sports: “Five years ago didn’t matter today. They were very disappointed back then but today was a very different game. We showed great things during the game and we are very happy with the three points." On the title race: "We just focus on our games, we have a massive game next in the Champions League then to Cardiff which will be tough as well. So we will see. I’m always excited, I’m always happy when my team wins, but it can change, for now we just need to enjoy it and we have a big game on Wednesday again." Well, that's me done for the day. Liverpool are two points clear at the top. But Pep Guardiola's Manchester City are hot on their heels with a game in hand. Two great teams, two great managers. And a scintillating title race. You can read the match reports on both of today's games on the BBC Sport website and catch highlights on Match of the Day later tonight. Join us again tomorrow as Watford host Arsenal in another big game which could influence the top four. More from Maurizio Sarri on the first goal: “In my opinion there was a foul on Emerson, but I think the level in Premier League is the best in the world but not for the referees. I think the level of the referees is not in line with the championship. “And then we were unlucky after the second goal because we reacted very well and had three goal opportunities in three minutes." 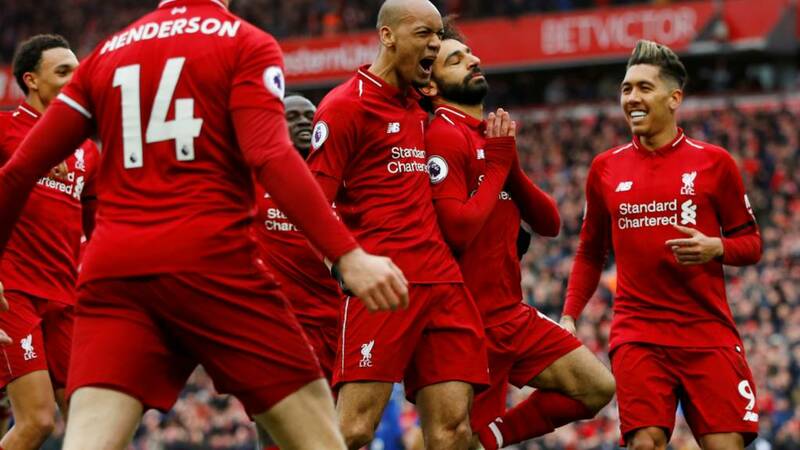 More from Jurgen Klopp to BBC: "I’m so proud of the team, it was a fantastic performance. What a team, what a stadium, what an atmosphere. I’m so thankful I can be a part of this, it’s great. It’s just outstanding, very overwhelming at times. On the title race:"The first question in the meeting today was 'what is the City score?. You cannot avoid knowing about it. But it isn’t interesting to us. Liverpool boss Jurgen Klopp speaking to BBC Sport: "I had the best view [of Salah’s goal]. I saw earlier than most people that it would go in. What a finish, what a shot. But the whole move around it. Wow, brilliant. "In the first half we played against the wind, in the second half we had the wind at our backs. So we used that obviously. Then at 2-0 up, there was a little system change from the opponent, with Hazard moving to the left and [Gonzalo] Higuain upfront. Since the start of last season, Salah has scored more goals in all competitions than any other Premier League player (66). Tom McCarron: Amazing title race. City have spurs at home next then away to United. We have Cardiff away and Huddersfield at home. If they're ahead or level after those fixtures it's theirs. Chelsea boss Maurizio Sarri, speaking to Sky Sports: "We played a good match against wonderful opponents. We stayed in the match for 50 minutes. After the second goal - a shocking goal in a good way for them but not for us - we reacted. We had two or three opportunities to score but I think we played very well. "Probably at this moment they are better than us but we are going the right way. After the second goal, we had three opportunities with Eden and Higuain. We were not lucky for sure. We hit the post for the 35th time in our season. "In my opinion we are going in the right way. We are improving. Three months ago we were not able to stay in the match." On Chelsea's chances of a top-four finish: "It's not easy of course but we have to fight to the end. It will be very hard for every team in the last month of the season. We can expect very strange results in last month because we are tiring like all the other teams." That Mohamed Salah goal is one you will want to watch again! Don't miss Match of the Day tonight. It kicks off at 22:30 BST on BBC One. Liverpool boss Jurgen Klopp, speaking to Sky Sports: "It was a really good game, difficult against strong opponents. I thought we dominated in areas. The rhythm was really good. We tried, created, passed and shot - we did pretty much everything." On Mo Salah's sensational goal: "A brilliant goal, world-class. A really, really, good goal from our side. It was a brilliant goal in all departments." On Jordan Henderson: "I only know Stevie [Gerrard] as a person - I've no idea about his leadership skills. Hendo is a fantastic skipper for this club - I've said it from the first day. There was not one part of him that was not important. In the last three games he's obviously on fire which is good." On the title race: "We have to try at least [to win all remaining games]. We respect all opponents so much. We know about Cardiff's fight against relegation. " Talk about a way to banish memories of that fateful game five years ago. Some people say Mohamed Salah has not been at his best this season, but Liverpool fans won't care if he can still deliver goals like that in the biggest games. Also worth remembering that Liverpool now have 85 points with four games remaining, one point less than the total with which Manchester City won the 2014 title. Aron: Title race is impossible to call but if Liverpool carry this form into the UCL, then I think (and hope, as a fan) they win it. Nobody in Europe's top contest looks capable of matching them at the moment, not even City. Chelsea defender David Luiz speaking to Sky Sports: “It’s difficult, we had our chances, they had their chances, they scored and we didn’t. A great game but a bit frustrating. Jurgen Klopp on Jordan Henderson: "In the last three games he is obviously on fire!" On marking Eden Hazard: "I like to play against the best players in the world and he’s up there. He’s a fantastic player. Chelsea is a fantastic team but we managed to put them under pressure."